Tired of basic forms and spreadsheets? Want to attract more speakers? How do review panels, editable submissions, and event app integrations sound? Call for proposals is one of PheedLoop's most powerful, and deeply integrated systems. Create custom flows, embed custom surveys, capture session and co-speaker data, enable file uploads, and more. Want to attract more speakers? By capturing intent early, sending completion reminders, and allowing for editable submissions, PheedLoop will significantly boost the number of proposals you receive. Create review panels, and even specify areas of expertise to reviewers. Each reviewer automatically gets access to their reviewer portal, where they can start grading proposals based on your criteria! Tired of email tag with speakers who want to edit their proposals? Not anymore! Once submitted, applicants can always go back to view their status, and edit every aspect of their submission until your cut-off date! Ready to accept a proposal? Speakers, sessions, and their files are instantly added to your website, app, and guides. Speakers also get instant access to their speaker portals! All you have left to do is give their sessions dates and times on the schedule, and you're done! Save days to weeks of work in an instant. How many co-speakers can applicants add? The limits depend on your settings. After submitting , the applicant can continue to edit every aspect of their proposal, at which point, if allowed, they can add more co-speakers. What session-related fields are captured? 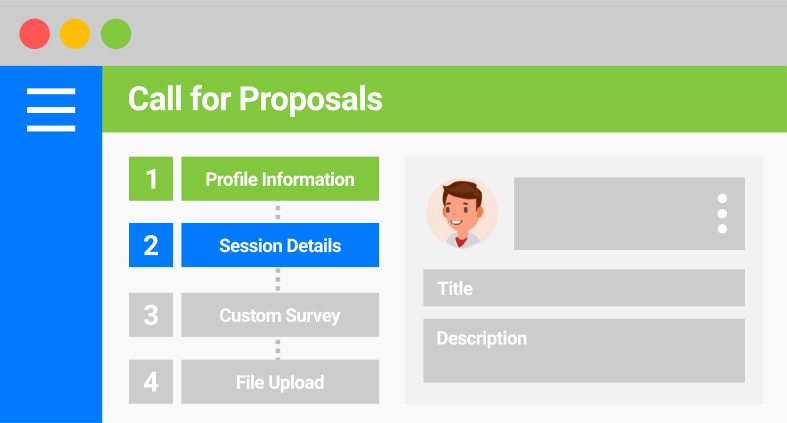 Session title, description, files, tracks/themes, presentation format, and target audience are captured by default. You can adjust these, and add any custom questions. How does PheedLoop get more speakers? Simply by capturing intent. PheedLoop tracks incomplete applicants, or those who were about to submit a proposal, and automatically follows up regularly to get them to finish things up. Can I assign specific proposals to reviewers? 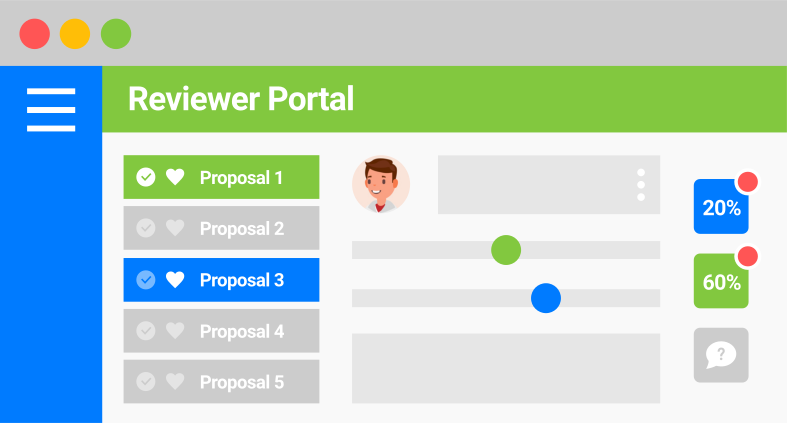 PheedLoop allows you to apply several filters to narrow down which proposals any particular reviewer sees. Filters like session track/theme, format, target audience, etc. Can I export proposal data? PheedLoop allows you to export all your proposal data at any time from your dashboard. The exports contain complete speaker/session details, and average grades from reviewers. Can I turn off proposal editing? Absolutely! At some point, you'll definitely want to stop more changes from happening. You can turn off all or specific editing functions at any time via your dashboard. Are proposal portals mobile compatible? Yes, proposal portals can be accessed via any device, desktop, tablet or smartphone. 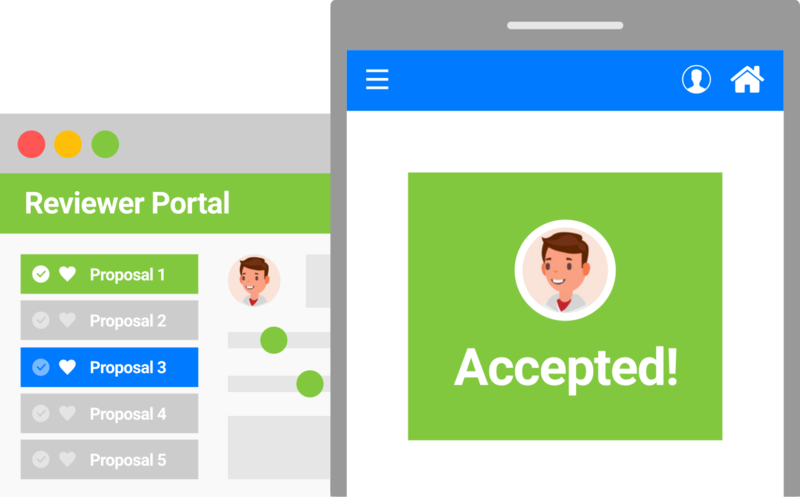 Reviewer portals are also mobile compatible, ensuring simple applying and reviewing. Can I hide personal details from reviewers? Yes! If you would like to hide personally identifying details tied to proposals from reviewers in their portals, it takes no time at all to set it up via your dashboard.